This killer little video was shot on the trails in the inland portion of San Onofre State Beach, right in the area where the toll road would have gone. If you want to make the same ride, head to the southern end of Avenida La Pata in San Clemente for the trail head. Easily accessible from the San Mateo Campground too. Chucks mountain bike (helmet cam) from Chuck Patterson on Vimeo. And as you know, The Surfrider Foundation has an affinity for parks (not just because our Trestles campaign helped stop the toll road), but we also appreciate the state park system because 7 of the top 10 most popular parks in California are located along our precious coastline! California's state parks are falling apart because of decades of underfunding. Our state parks are struggling financially and need permanent funding to ensure they are maintained (i.e. hiking trials, campsites, bathrooms, visitor centers, kiosks, etc), AND that enough staff and personal are hired to ensure our parks are safe (i.e. lifeguards, rangers, facility managers, etc). Last November, the Surfrider Foundation supported the California State Park and Wildlife Conservation Trust Fund Act of 2010 as a way to maintain healthy parks. This summer, the California State Park and Wildlife Conservation Trust Fund Act officially qualified for the November ballot; now called Proposition 21. 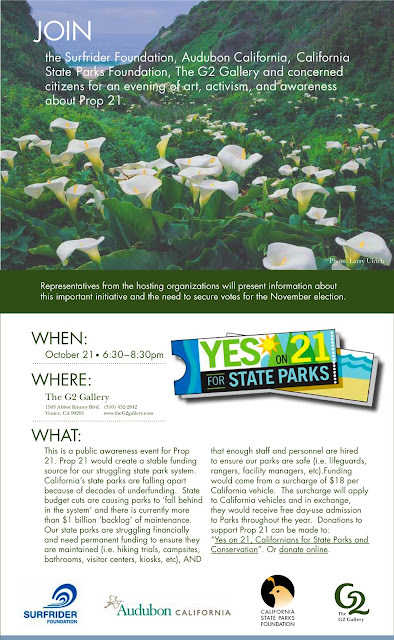 Prop 21, slated for the Nov 2 election, will create stable and adequate funding for parks. The funding would come from an annual "State Park Access Pass" surcharge of $18 per California vehicle. The surcharge will apply to California vehicles and in exchange, they would receive free day-use admission to Parks throughout the year. The folks running the ballot initiative are looking for supporters and volunteers, visit their website. Please read a recent blog post about why Surfrider is supporting park protection efforts. As we all know, Trestles is arguably the most popular surfing break in North America, attracting over 300,000 people a year. To save time, nearly a third of these visitors take a shortcut along an unmaintained trail, cross the railroad tracks, and follow any number of impromptu footpaths through some of the most pristine marshlands left in Southern California. The San Onofre Foundation has partnered with Architecture for Humanity to ask how can we address the recreational demands of the State Park safely, while also protecting and conserving the experience of Trestles -- a surfing and environmental world treasure. To explore different solutions, "Safe Trestles" was launched, an open-to-all design and ideas competition that asks how can we eliminate the dangers of crossing active railroad tracks, and create low-impact access to Trestles. In the mean time, anyone can join the discussion and help shape the future of Trestles here. 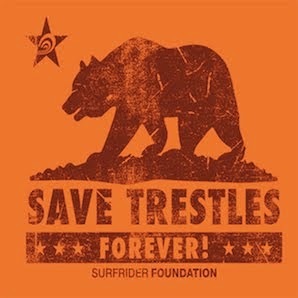 Please go here to read Surfrider's perspective on "Safe Trestles". Just a quick note to encourage you to visit a couple other blogs dedicated to life at Trestles. Trestles Surf Crowd is written by long time local Norris Brandt, providing fun and interesting insights on all things related to surfing at Trestles. 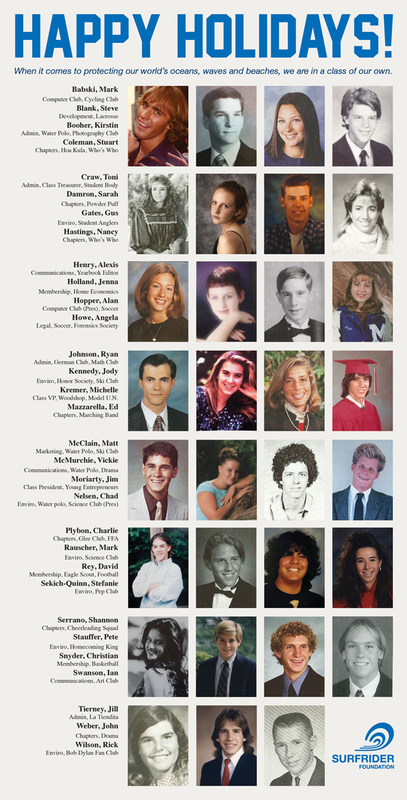 Washed Out from Thomas O'Hara on Vimeo. So spend some time over there and give them some feedback.